Sterling silver Blackpool Tower charm. The tower was built between 1891 - 94, it is 518 feet tall and was inspired by the Eiffel Tower. 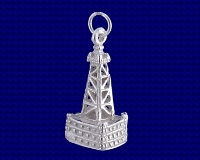 Craftsman made Sterling silver Blackpool Tower charm.